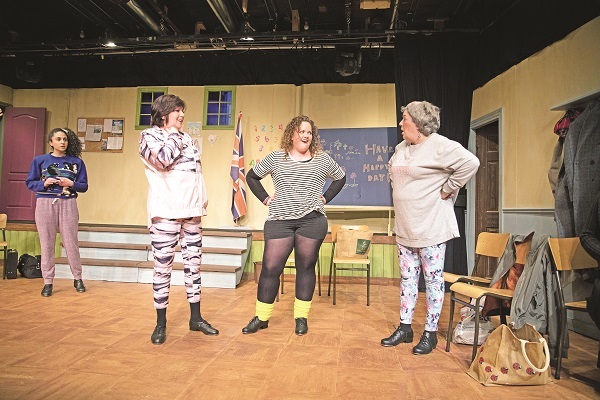 Theatre Aurora wraps up its season with the toe-tapping (literally) comedy “Stepping Out”. When they have the opportunity of performing in an upcoming recital in front of a large audience, will these amateurs overcome their lack of experience, stage fright and some internal drama to come together as a well-choreographed unit in time for their big night? This is one of the largest casts on stage at Theatre Aurora this season. Jessica Ducharme is Mavis, the former chorus girl, teacher, and sometimes confident of the group. She is assisted in her efforts by less than enthusiastic pianist Mrs. Fraser, portrayed by Donna Corbett. The eight dance students are Lynne (Emma Hood), Dorothy (Kristina Garritano), Maxine (Julie Lennick), Andy (Laura Halley), Sylvia (Heather Laroche), Rose (Geri Sefi), Vera (Barb Jones) and Geoffrey (Bruce Williamson). All bring realistic portrayals of their characters, ranging from shy to outspoken, and the audience can watch the evolution of each character’s personalities, relationships and dance skills as they work towards their big night. The set is simple but effective, and good use of costumes helps establish each character. With this production Theatre Aurora is concluding its current season on a strong note. Evening performances of “Stepping Out” continue at Theatre Aurora, 150 Henderson Drive, April 4, 5, 6, 11, 12 and 13 with a matinee April 7. Information and tickets are available through the box office at 905-727-3669.